A much anticipated rematch, almost eight years in the making, was finally settled by Badr Hari who, secured an unanimous decision victory over, Hesdy Gerges last night at the Ahoy Rotterdam. The result was a reasonably good return after 15 months of inactivity and reinforced Badr’s post-fight comment of, “I don’t lose rematches”, after winning the GLORY 51 headliner. Speaking to GLORY commentator, Todd Grisham afterwards, Hari opened-up about about: his successful return to kickboxing; what it means to be part of GLORY moving forward in his career; his own post-fight analysis; and that potential rematch with Rico Verhoeven was discussed too. Badr had surprised everyone at the weigh-ins (the day before), weighing-in at 101.8kg which, was approximately 13kg lighter compared to, his previous fight against Verhoeven in December 2016. This leaner, meaner looking version of Hari is reminiscent of his younger and more threatening self for his heavyweight rivals. Who or what’s next for Badr will be certainly be interesting to see, especially if its another grudge match with another adversary from the past. Click here for the full results and roundup from all the action at GLORY 51 Rotterdam. “Like” K1ANOOP on Facebook & Subscribe on YouTube for more independent and insightful Kickboxing coverage, interviews and mini documentaries. 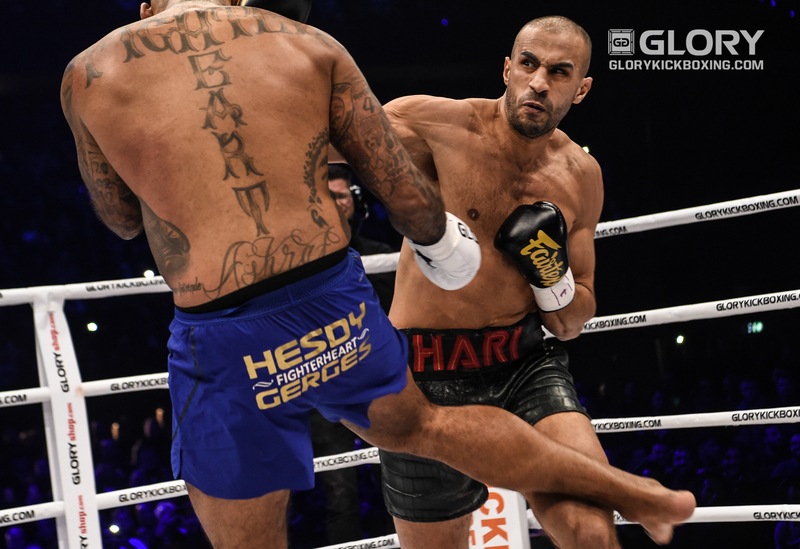 Badr Hari returned to GLORY Kickboxing after 15 months of inactivity (and jail time) to defeat Hesdy Gerges via unanimous decision in the headline bout of GLORY 51 Rotterdam. The rematch had been 8 years in the making after Hari was disqualified for shin kicking Gerges in the head (whilst on the canvas) in their previous meeting at, It’s Showtime Amsterdam in May 2010. Georges would stay composed in the first round and Badr would be the more active striker but come the second round, Hesdy would do what he had promised leading up-to their “Bad Blood” rematch; and put the pressure on Hari. However, come the third and final round and with both men visibly tiring, Badr would have the better gas tank and convincingly took a gritty third round to secure the decision. Badr Hari’s application of body hooks as part of his attacks to the body were noticeable throughout the fight and characteristic of his striking habits from years gone by. “The Golden Boy” even utilised his trademark spinning heel kicks on a couple of occasions to try and catch out Gerges who, had been caught out from a head kick in his previous fight and KO loss to, Mladen Brestovac at GLORY 45 Amsterdam – the Dutch capital being marked by GLORY‘s now CDO and former CEO, John Franklin – as a target for Badr Hari to return to on a future GLORY event in 2018. Alim Nabiyev would put the pressure on Cedric Doumbe in the final round of their title eliminator, putting the former GLORY welterweight champion in visible trouble to secure a convincing decision. Doumbe suffered his second defeat in GLORY since losing (his first) to, Murthel Groenhart by decision at GLORY 44 Chicago. Since then Groenhart lost the title on his first defence by a shocking first round TKO to new welterweight champion, Harut Grigorian at GLORY 50 Chicago in their trilogy. Nabiyev’s victory should set-up his opportunity to try and take the belt from Grigorian in the coming months with possible changes to the recently announced GLORY 53 Lille fight card which, Doumbe had been announced as headlining before tonight’s loss. 🇦🇿 Alim Nabiyev gets his hands raised inside @rotterdamahoy by taking out another former welterweight champion! Eyevan Danenberg continued to impress by winning the GLORY 51 Contender Tournament by seeing off Thongchai Sitsongpeenong (in the final) via unanimous decision after, a messy affair (in the semi-finals) against Jimmy Vienot via split decision. The tournament success follows on from Danenberg’s flawless win by decision over the resilient Jamie Bates at GLORY 49 SuperFight Series. On current form surely “Mister Cool” can expect to challenge for the welterweight title in the first half of 2018? An exciting fight between Massaro Glunder and Victor Pinto would result in Glunder gifting his Dad, Rodney Glunder, with a nice (belated) birthday gift of an unanimous decision victory over, the younger of two Pinto brothers. 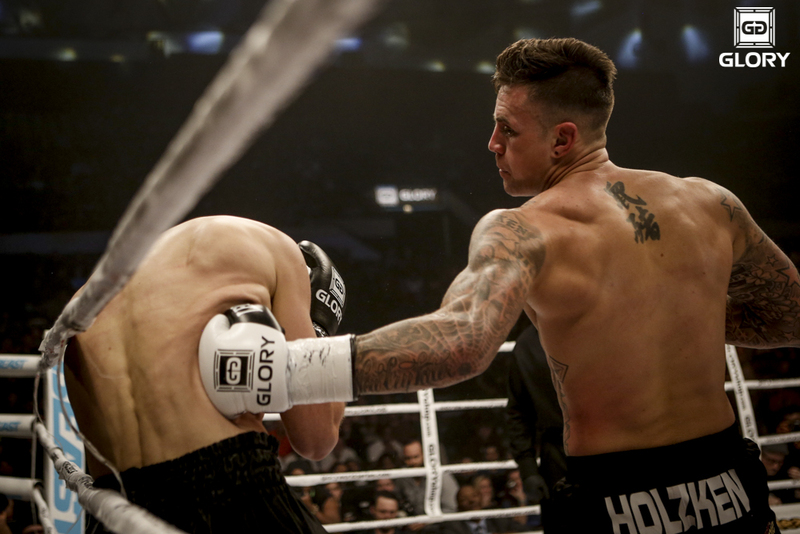 Glunder bounces back from a controversial defeat to Dylan Salvador at GLORY 47 Lyon and looks certain to build on his current momentum within the lightweight division by ideally returning to action as swiftly as possible. Full results from both the GLORY 51 Rotterdam and GLORY 51 SuperFight Series fight cards are below. Badr Hari def. Hesdy Gerges via unanimous decision (UD), heavyweight bout. Eyevan Danenberg def. Thongchai Sitsongpeenong via UD. Tomas Mozny def. Daniel Skvor via UD, heavyweight bout. Eyevan Danenberg def. Jimmy Vienot via split decision. Thongchai Sitsongpeenong def. Alan Scheinson via split decision. Alim Nabiyev def. Cédric Doumbé via split decision, welterweight bout. Mohammed Jaraya def. Miles Simson via unanimous decision (UD), welterweight bout. Tyjani Beztati def. Anil Cabri by Rd1 TKO, lightweight bout. Massaro Glunder def. Victor Pinto via UD, featherweight bout. Kevin van Heeckeren def. Bart van der Kroon by Rd1 KO, middleweight bout. GLORY 50 Chicago delivered a memorable night for GLORY‘s first main event of 2018 with, Harut Grigorian dethroning Murthel Groenhart for the GLORY welterweight title in the headline bout; Benjamin Adegbuyi won the Heavyweight Contender Tournament in dominant fashion; and Sitthichai Sitsongpeenong retained his lightweight crown via unanimous decision against, Christian Baya at the UIC Pavillion. The third instalment of Groenhart vs. Grigorian was cut short from a first round referee stoppage that some may say was “karma” (after Groenhart’s controversial victory at GLORY 42 Paris) but others questioning if the fight may have ended too soon. The trilogy between both welterweights now makes it one win for Grigorian and two previous victories for Groenhart – all by stoppages for the hard hitting rivals. Comparisons were even made with the controversial ending of, Artem Levin vs. Simon Marcus at GLORY 27 which, happened two years ago in Chicago. Could a a third rematch be on the cards in the near future between Groenhart and Grigorian? However, referee Chris Wagner, explained his first round stoppage of Groenhart vs. Grigorian to US based reporter, Michael Stets Steczkowski and that it was to prevent Murthel Groenhart “from getting hurt even worse”. Just spoke to referee Chris Wagner. He said he waved it off because he saw Groenhart’s eyes roll completely back and said he saved him from getting hurt even worse. The 4-man heavyweight contender tournament was won by Benjamin Adegbuyi who, emphatically KO’d D’Angelo Marshall, in the first round of their semi-final and then went on to win by second round TKO against, Junior Tafa, in the final. The victories put Adegbuyi back in-contention for possibly another title-shot against, GLORY heavyweight champion, Rico Verhoeven, after a disappointing and controversial decision loss to, Guto Inocente at GLORY 43 New York. Adegbuyi will be eager to return to GLORY Kickboxing action as swiftly as possible no doubt, after being inactive for six months since GLORY 43. However, Guto Inocente had actually defeated Junior Tafa in their semi-final on the night via unanimous decision but GLORY would then confirm that “due to a cut suffered in the semi-finals”, Inocente was not able to fight against Adegbuyi in the final and so, Tafa would replace Guto, despite the semi-final result. The decision by GLORY for Tafa to replace Inocente in the final of the GLORY 50 Contender Tournament against Adegbuyi was best explained by Steczkowski as below in-light of, Haze Wilson vs. Anthony McDonald being cancelled (earlier) on the GLORY 50 SuperFight Series card (as potentially a reserve bout for the tournament if anyone was injured). Since defeating Robin van Roosmalen for the GLORY lightweight title at GLORY 31 Amsterdam in June 2016, Sitthichai Sitsongpeenong defended his championship for a third time in the headline bout of, the GLORY 50 SuperFight Series card against, Christian Baya via unanimous decision. Kickboxing fans and enthusiasts online were all in-agreement that Sitthichai was the dominant of the two for all five rounds. The question that remains unanswered is as to who, can GLORY now bring in, to pose a serious risk to Sitthichai’s continued dominance as GLORY lightweight champion? Sitthichai Sitsongpeenong put on a masterful performance against Chris Baya. It’s amazing how big the skill disparity is between a top-10 lightweight and the best kickboxer in the world. Sitthichai made it look easy. Full results for both GLORY 50 Chicago & GLORY 50 SuperFight Series are as below. NOTE: Inocente was replaced by Tafa in the final due to injury/cut. 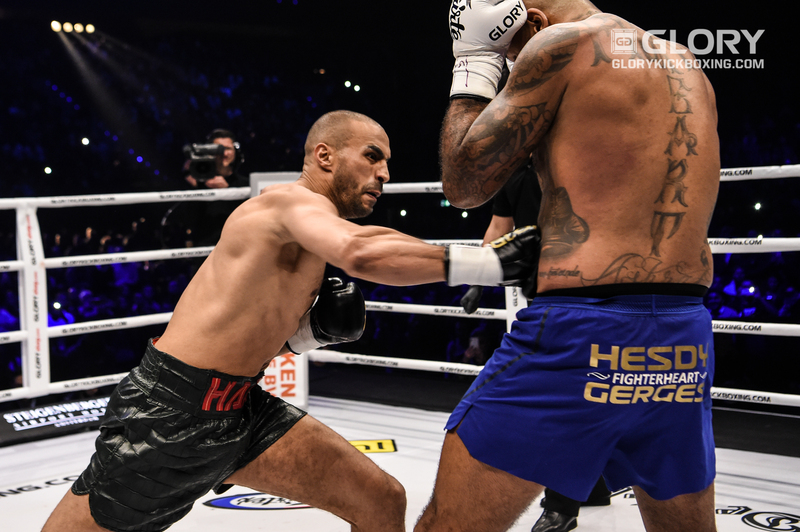 Badr Hari vs. Hesdy Gerges will headline GLORY 51 Rotterdam as announced earlier this morning in a much anticipated rematch. The two heavyweight rivals had previously fought each other at It’s Showtime 2010 Amsterdam but Hari would be disqualified for shin-kicking Gerges in the head whilst he was on the canvas. “The Golden Boy” and Gerges were once coached by legendary Dutch kickboxing coach, Thom Harinck at the Chakuriki Gym, only for Badr Hari and Harinck to have fallen-out very badly. Badr opened-up about this in the past when interviewed by Michael Schiavello and admitted that the bitter resentment he had towards his former trainer at the time, was what fuelled his disqualifying actions against Gerges when they previously clashed. Nevertheless, the announcement this morning will undoubtedly have world kickboxing fans hyped-up following on from, a very successful year end event at Glory Redemption: Rico vs. Jamal which, was also at the Ahoy Rotterdam, where GLORY 51: Badr vs. Hesdy will also take place on March 3, 2018. Gerges was very quick to call-out Badr for a rematch on social media after it had been announced at GLORY 49 SuperFight Series that Hari had signed a multiple-fight contract with GLORY; and despite coming off a very bad head kick KO to, Mladen Brestovac at GLORY 45 Amsterdam, fortunate would seem to favour Gerges than Brestovac, in returning to action in a very high profile fight against the biggest star in kickboxing. “Like” K1ANOOP on Facebook to keep up-to-date with all the latest kickboxing news, interviews & Subscribe on YouTube for much more kickboxing coverage. Mike Passenier opens-up on the return of the “Golden Boy” Badr Hari at GLORY 51 Rotterdam which, was announced at GLORY 49 and gives a round-up of: his breakthrough fighters in 2017 at Mike’s Gym; Glory Collision: Rico Verhoeven vs Jamal Ben Saddik; and a look ahead at, Collision 2: Badr vs Rico rematch in 2018 & much more. 14:30 Should Rico Verhoeven have got an 8-count from the referee? 24:24 Forecast for 2018 & bad intentions for Harut Grigorian. Badr Hari signed a multiple fight contract it was announced last night at Glory 49 SuperFight Series with GLORY Kickboxing dropping an epic video trailer to break the news prior-to, Glory: Redemption commencing at, the Ahoy Rotterdam. However, GLORY CEO, Jon Franklin confirmed to K1ANOOP that GLORY Kickboxing are confident of arranging for, Badr Hari to fight again in Amsterdam in 2018 (video below). Glory: Redemption was headlined by a successful title defence for GLORY heavyweight champion, Rico Verhoeven with, an emphatic fifth round KO of, Jamal Ben Saddik in what was a much anticipated rematch from six years; Saddik had previously stopped Verhoeven six years ago. Rico would redeem himself in a thrilling year end event for the promotion which, was capped-off with the signing of kickboxing’s “Golden Boy”, Badr Hari. Hari’s return fight for GLORY will be on March 3, 2017 at the Ahoy Rotterdam with strong rumours circulating that heavyweight rival, Benjamin Adegbuyi is on the short-list of potential opponents along with, three-time K-1 champion, Remy Bonjasky; Enfusion two-weight champion, Luis Tavares; Patrice Quateron; Hesdy Gerges; and Daniel Ghita. K1ANOOP will report again as the situation develops further.